"When it comes to my major, I love how small and intimate the classes are. You are able to have that personal rapport with other students, professors and faculty, while obtaining important one-on-one guidance." "On the day of my first Miami visit, my dad and I were Uptown at the SoHi sandwich shop getting lunch, and all of a sudden Dr. David Pennock, the director of the Mallory-Wilson Center for Healthcare Education and Miami's Premedical Studies program, came up to us and struck up a conversation about what I was interested in studying. "Once I told him I was strongly considering a Premedical Studies co-major, he instantly sat down and discussed his role and how great of a school Miami was! I remember being so impressed, because nowhere else had a professor taken time to engage me so directly and make sure that I felt welcome. Yet there I was, having lunch with an important member of the faculty who was willing to go out of his way for me. And amazingly enough, to this day, the faculty at Miami has never stopped being just as helpful. "After choosing Miami, my first year turned out to be a blast and my favorite by far. Going in I knew that I wanted to go into the Premedical Studies program, and it wasn't long after that I declared Microbiology as my major. It was also during this time that I discovered my passion for neuroscience, which I plan on eventually declaring as a second minor. "Besides Dr. Pennock, two other professors stand out in my mind, and together they have impacted my college experience as living proof that Miami was the right choice. Mitch Balish, my undergraduate research professor, has really aided me throughout the years by serving as a step-in advisor who is always willing to offer great guidance. Gary Janssen is the professor who I credit with changing my perspective on microbiology; he not only taught me about microbiology, but also how to truly learn!" 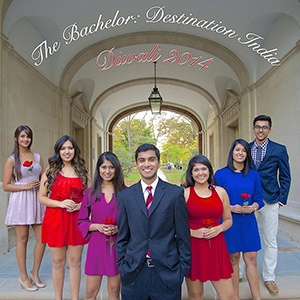 Members of the Indian Student Association pose for Diwali 2014 publicity photo. "At Miami I've been lucky enough to do a number of things outside my classes, including performing undergraduate research in microbiology, studying abroad in France, and getting involved in student organizations, like the Indian Student Association [ISA], where I'm currently the social chair and head choreographer for the annual Diwali Show. "I absolutely love my involvement in the ISA. This year we're putting on another Diwali celebration, so it’s a very exciting time. I happen to have a large number of friends within the organization and have always enjoyed remaining involved over the years, especially on the executive board. In a way, it is very rewarding because it puts me in a position to raise more awareness about Indian culture and diversity on Miami's campus, while seeking to preserve its traditions in positive ways. It definitely brings a piece of my home and heritage back to Miami as well, which I find to be my favorite part. In my spare time, I also contribute a lot of community service, especially within my sorority, Kappa Delta. "I also did a summer study abroad trip during my sophomore year in Dijon, France. It was a French immersion program, so we got to learn and explore so much about that facet of European culture! It was fantastic how closely I got to know the people I traveled with. I met my current roommate and made many close friends. During my travels, I got to learn all about French culture, architecture, and lifestyle. The food was also incredible—every morning I still crave a French pastry! "Of course, my favorite times at Miami will always be the ones I spent with my close friends. Together we never get tired of relaxing, hanging out, and getting to know one another. When it comes to blowing off steam, my friends are always the best solution. We see movies, go shopping, have dinner, or enjoy a fun night Uptown. Furthermore, I love to exercise when I get the chance. I definitely need a run every once in a while to release some energy and stress." 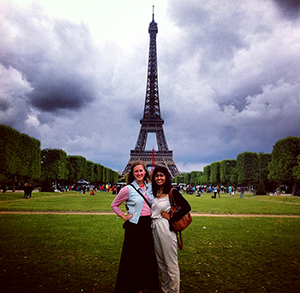 Neena Patel (right) and a friend pose in front of the Eiffel Tower in Paris. "Being a liberal arts major gives you exposure to an education that requires you to use more critical thinking skills. It also offers a more holistic view of the world. For example, right now I'm heavily involved in a lot of science courses, but I'm also taking a medical anthropology class. Although it's very different, this class does a great job of tying itself into what I'm learning within my other science courses, mainly because epidemiology and sociology are integral parts of the medical field that can make a difference. "In terms of courses, sociology has perhaps been the most effective at widening my perspective. Two semesters back when I took the class, my attention was intensely focused upon the unjust differences that we don't always see in society and also how we can bring them to light for the greater good. It really changed my perception on what individuals, including myself, can do to make changes for the better and encourage equality. 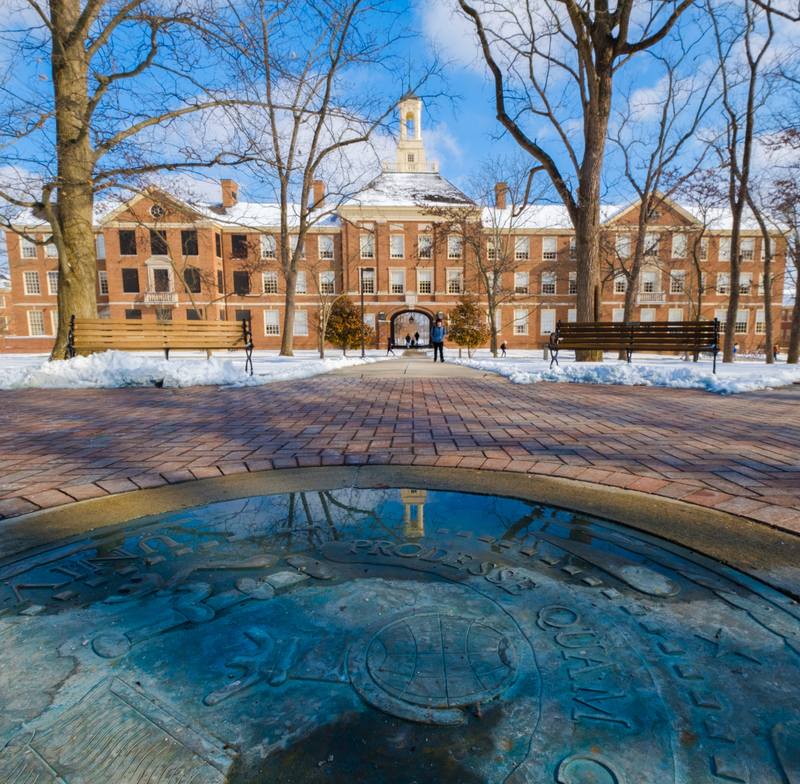 "However, when it comes to my major, I love how small and intimate the classes are. You are able to have that personal rapport with other students, professors and faculty, while obtaining important one-on-one guidance. Additionally, what I love about my microbiology major is that it never stops being challenging—they never really take it easy on you! This pushes you to gain a deep and sincere understanding of the field. With the emphasis on critical thinking, we can comprehend what happens if certain scientific aspects are changed or taken away." "One illustration of my opportunity to utilize my critical thinking is in the microbiology lab. I find it fascinating that things as small as bacteria can be so complex, and that the minutest differences can have huge and life-altering effects. In a way, this is where a lot of my inspiration stems from within microbiology. 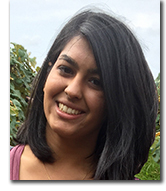 "One of these main opportunities is undergraduate research, which scoops up most of my time. I landed the experience by reaching out to multiple professors and seeing who needed help. Right now, I work in Dr. Balish's microbiology lab and do research on HIV and AIDS. "In one project, I work with a graduate student by looking at a particular protein found inside of a bacterial cell. In another project, I work with another undergraduate student and focus upon taking high-resolution microscopic images of a particular bacteria. Working in a lab is extremely rewarding. It has given me a deeper understanding of the concepts that I have learned in class because I get to apply the things I learn in a hands-on way. "Ultimately, I'm confident that my Microbiology major and Premedical Studies co-major have given me a strong foundation for a career in medicine. Miami has done a fantastic job with not only helping me understand and interact with complex subjects, but also in giving me opportunities beyond the classroom to apply my knowledge in different ways." "I would definitely recommend getting to know your professors. Be sure to utilize their office hours, because it ends up making things a lot easier when you're looking for recommendations. In general, your professors have great advice to offer. After all, they're professors for a reason and they know what they're talking about! Office hours are great when you're struggling with a class, but they are just as valuable when you try to build collaborative relationships with those who are giving you guidance and education. "Whether it be research, study abroad, or academic majors, it's always important to step outside of your comfort zone and reach out to people. I know how hard it can be, but you have to teach yourself to take chances. If you don't put yourself out there, no one will make the effort to get to know you or take you on for special projects and opportunities. Keep that in mind throughout your college career, and take advantage of chances to challenge yourself!"